Despite strict ban and penalties, contractors engaged in waste collection continue to dump and burn huge volumes of garbage in open spaces. If you are taking the road along the rail yard at Baiyappanahalli in Bengaluru, you might need a face mask. Even before one reaches this section of the road, an ominous smell is sure to hit you. "For the residents of this area, this is a smell we have been battling with for the last two years," says Yuvaraja M, standing at the intersection to MS Nagar in Baiyappanahalli, where plumes of smoke from burning mounds of garbage is a common phenomenon. Yuvaraja, treasurer of the Resident Welfare Association (RWA) in Dr Kumar Layout in MS Nagar, traces the pungent stench to the cluster of garbage burning on the side of the main road, which is adjacent to the Baiyappanahalli rail yard. "The problem began when garbage from other areas ended up here. The Orion Mall bus stand area was the main spot where garbage from several residential areas was dumped. But, that spot got relocated to this area," says Yuvaraja, who has sent the Bruhat Bengaluru Mahanagara Palike (BBMP) multiple letters over the issue. And, the garbage here is occasionally set on fire. 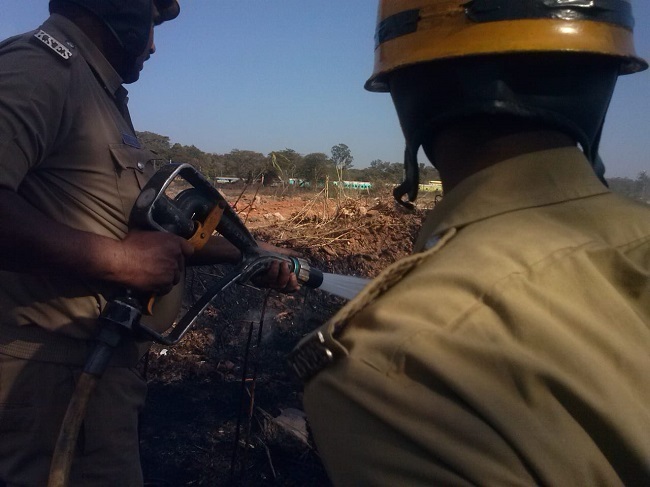 Once, in September 2017, Yuvaraja decided to call the fire department to douse the fire, although in vain, as dumping resumed within weeks and has continued unabated. "And we have not been able to do anything about this," he says. Several residents in Bengaluru share a similar experience as Yuvaraja. Although the BBMP introduced strict penalties for burning solid waste in open spaces, in November 2016, it has not been implemented yet and so the problem continues to persist. The letter of the law states that contractors found dumping or burning garbage will be fined. 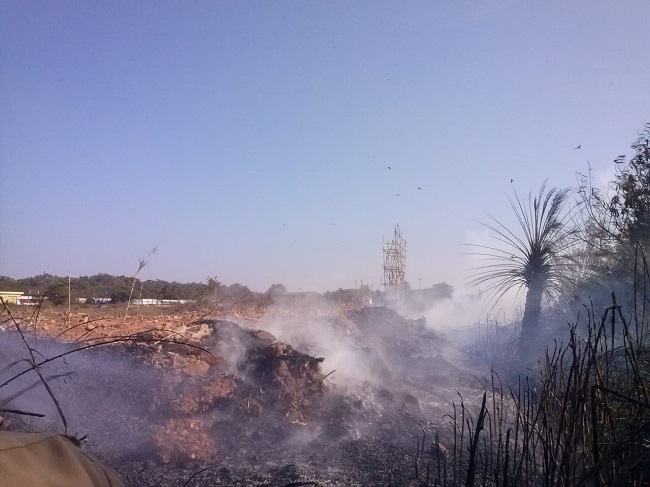 However, a surveillance project by Jhatkaa.org, a Bengaluru-based organisation, revealed that the garbage burning in open spaces is still being carried out in at least 40 different wards in the city. In a bid to raise awareness about the issue, Jhatkaa.org has developed a map and are inviting residents of the city to come forward and report areas where garbage is being burnt, via WhatsApp on 888-498-3333. These areas will be pinned on the map. The issue is particularly alarming in areas such as Indira Nagar, Baiyappanahalli, Banaswadi, Whitefield and Nayandahalli, as evidenced by the crowd-sourced map. Tracts of roadside areas have been turned into garbage mounds, which are lit on fire from time to time. The National Green Tribunal (NGT) and Karnataka State Pollution Control (KSPCB) have also prohibited open garbage burning, with fines up to Rs 25,000 for contractors engaged in the solid waste collection, if they are found violating the rule. But despite a penalty system, contractors who handle solid waste in the city claim that they are rarely forced to pay up. In May, Jhatkaa.org had filed an RTI query to four BBMP divisions, to inquire if fines have been imposed on contractors; if yes, what is the penalty amount. The organisation received the responses in August. While the BBMP officials in Yelahanka, Jayanagar and Rajarajeshwari Nagar declined to answer and referred the RTI to the health department in the ward, Byatarayanapura division said that no such offence has come to their notice. According to BBMP Sarfaraz Khan, Joint Commissioner, Health and Solid Waste Management, “BBMP engage these contractors to just collect waste from bulk generators, such as apartments and restaurants. These contractors dump and burn garbage in open spaces on their own." The contractor adds, “If contractors are given incentives, we will treat waste as per rules. 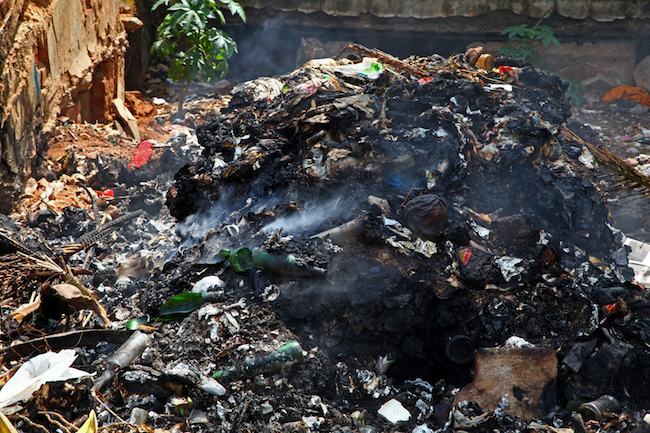 The practice of burning garbage in the open is not only illegal but also highly toxic. While Bengaluru prides itself for its relatively cleaner air in comparison to other metropolitan cities in India, an independent study has found that it does not necessarily mean that the city's residents are breathing clean air. The Karnataka State Pollution Control Board (KSPCB) measures ambient air quality, which tracks average data of air pollution over a period of one day. However, a study published by Climate Trends and Co Media Lab, a city-based organisation, showed that fine particles (PM 2.5) in the air would touch hazardous levels during peak traffic hours in the city. The reasons for the high levels of emission were attributed to vehicles and open waste burning. The study highlighted that open waste burning contributed to 16.1 % of the city's concentration of PM 2.5 particles. And yet, the problem continues to haunt Bengaluru and its residents. Those in the line of fire often include waste workers, including pourakarmikas, who are tasked with waste segregation. "Few pourakarmikas were asked to burn the waste collected in a drainage next to the Old Madras Road last week I have tried to highlight this but the mestri (contractor) did not take up the issue," says Uma, a pourakarmika from Indira Nagar. When TNM visited the spot, the residue of burnt garbage was evident. The rampant burning of garbage in the city represents a system that has failed. However, there is no dearth of solutions if BBMP makes it a priority to take action against the offenders.